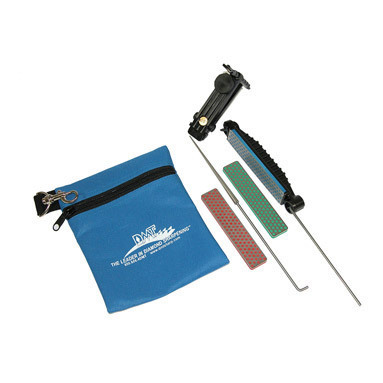 DMT Aligner™ ADELUXE Easy Edge-Guided Sharpening Kit. For professional sharpening results, regardless of skill, you can depend on DMT Aligner Kits and Accessories. Coarse diamond (45 micron / 325 mesh) quickly restore a neglected edge. Extra-Fine diamond (9 micron / 1200 mesh) to polish and refine a razor edge, after sharpening with a coarser diamond stone. Includes fabric storage pouch to carry the Aligner components. Maintains a consistent angle to ensure precision, shaving sharp edges. It is perfect for repairing chipped or damages blades. Unique system provides guided strokes with a 4 inch Diamond whetstone.